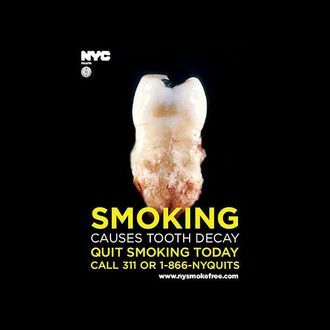 A U.S. appeals court ruled today that New York City cannot require retailers to display PSAs with rotting teeth, lungs, and brains as part of Mayor Bloomberg’s endless, expensive campaign against tobacco. The three judges involved noted that while “the City’s desire to tilt the balance more in favor of educating consumers is understandable,” only the federal government can “require retailers to post warning signs adjacent to cigarette displays,” Reuters reports. That’s another win for big tobacco companies, like Philip Morris and R.J. Reynolds, which are obviously concerned most of all with the legal questions regarding state and federal power. The Department of Health complained in a statement that “today’s ruling is likely to reduce the number of smokers who quit,” but that’s assuming bodegas even bother to take them down.